BMLL Technologies is a cloud-based data science platform for machine learning research and development offering access to historical full depth order book data, unlimited compute power and a wide range of data science and machine learning toolboxes. Born out of the machine learning labs in the Engineering Department at Cambridge University, it is a platform designed for data scientists by data scientists. You no longer need to buy and curate the data yourself from global financial exchanges, to be able to mine the value out of this trade data. BMLL holds every single trade and quote (on- and off-book) from Euronext back to January 2016. 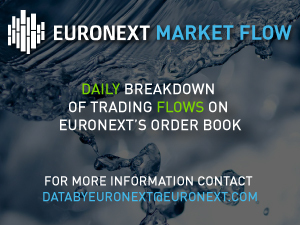 Users can analyse Euronext data alongside data from other European equity exchanges, as well as futures and options markets. In addition, access to trade reporting data allows in depth analysis of off-exchange data as well. To differentiate from more traditional historical data providers, users do not buy data, compute power and analytics from BMLL they rent it on-demand. Clients, including investment banks, hedge funds, asset managers, academic institutions, do not need to spend hours sourcing, processing and curating large data sets, not to mention support the cost of storing it, as BMLL does it for them. BMLL continues to add data sets, experience new use cases and develop in-house built analytical packages.